Saturday was another wet and windy day spent mostly in Urk until, determined to move, we were firstly thwarted by an Urkersluis closure, that blocked off an inland route; then we braved the Ijsselmeer in F4/5 20kn winds to make the Randmeren only to find the Roggebotsluis also blocked with maintenance so we had to spend the night on an isolated staithe and use the tender to transport a difficult Max to shore and back! 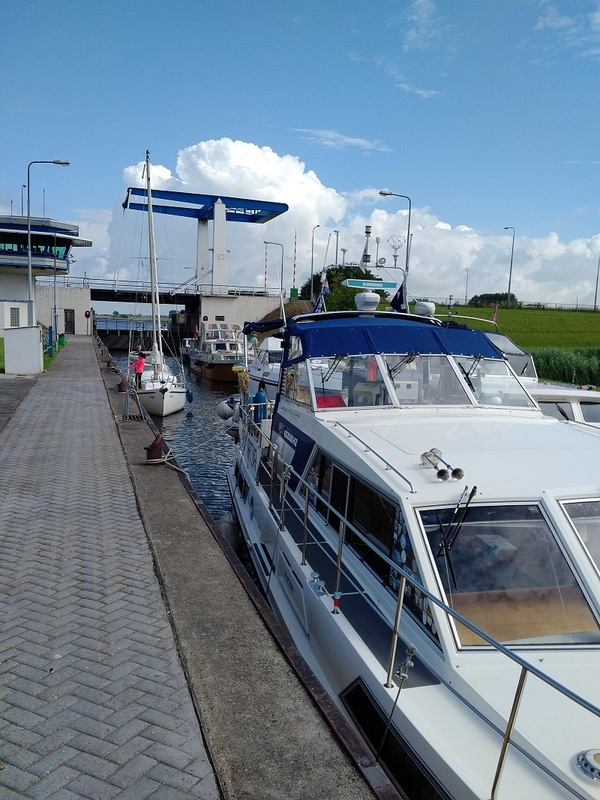 I had decided that we should set off and so we did in the strong wind; intending not to brave the rough Ijsselmeer but to cruise inland by the Flevoland route but we found the Urkersluis exhibiting two red lights and closed. It took me several phone calls and an hour’s delay to establish that this sluis was closed until Monday with a fault after which we cleared the decks, battened down the hatches and braced Lady Martina for that sea passage. It was a beam sea that alarmed Kathleen as the boat rocked and ejected the contents of the galley fridge and library cupboard on to the saloon floor but it was safe and bearable. We cruised on and under the huge Ketelbrug after which the sea became more settled and allowed Kathleen to go below and sort things out as I navigated and controlled the vessel. It started calmer in the Ketelmeer but there then developed a huge following sea; probably with the 20kn winds in opposition to a large outflow of water from the river after all of this recent rain. It then appeared to become plain sailing as the sun shone and we cruised peacefully along the Randmeren until we came within site of the Roggebotsluis where I spotted the dreaded double red lights again. Workmen had closed the bridge for two days’ maintenance and the only place to wait and moor was on an isolated stieger without shore access! We were greeted by other boats moored there including on who had seen us in several places including IJlst, and we shared information which suggested that it would be Monday before we could be let through. There was better news on the Sunday and a more beneficial situation as I woke up to see the guys testing out the Roggerbotsluis lift bridge that had been broken yesterday. They had obviously managed to get the lock-keeper along early this morning and I could see that that control room was manned and they were soon stopping traffic and looking like things were going to be fine. I walked Max along the stieger and chatted to the others. 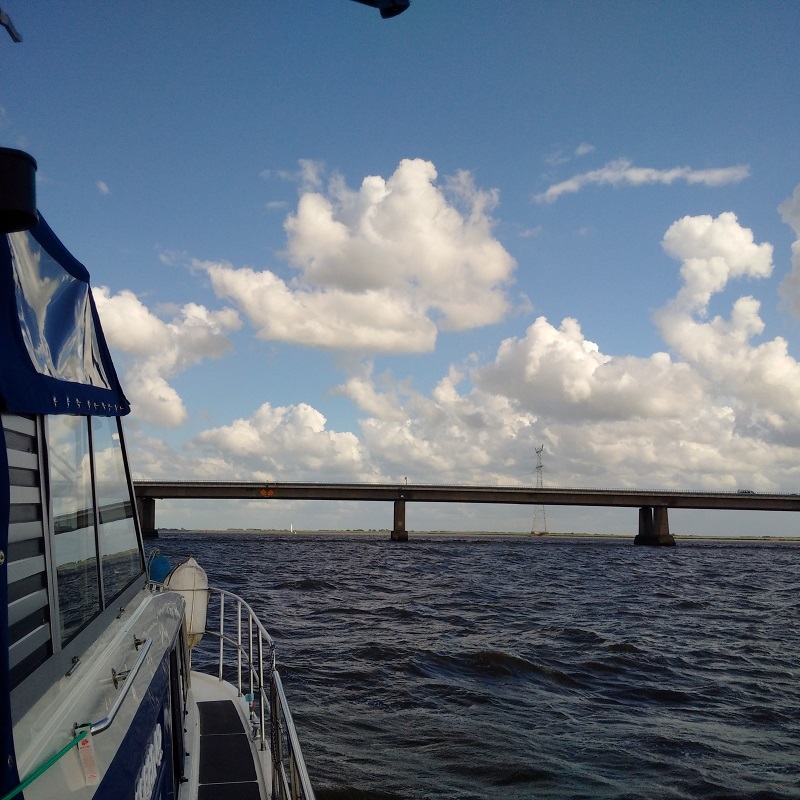 Between us, we had contacted the bridge-keeper on the VHF and understood that she was going to open the bridge at 10am and then let the boats through from the other side first and then let us all into the sluis soon after that. With that news, I brought our tender around to the stern and attached it to the davit wires and then got Kathleen to help me steady it as I used our newly-renovated electric winch wires to raise it very easily and simply into its correct, secured position. We were therefore right ready to move off and enter the lock when the lights went green on our side. The first three boats all moored up on the port side and not very near to the front of the lock at that and so I cruised past them and moored further forward on the starboard side. This meant that, when the lock opened, we were in pole position to depart first and so the German boat at the front of the other side seemed to be put out by that and stormed past us once we were in open water; leaving a huge wake which was interfering with boats moored nearby: What an idiot!! The cruise went very smoothly, although the wind was still fresh and there was still quite a following sea by the time we got further along the Drontemeer on the Randmeren. By this time the day was sunny if still very breezy and then, once we got close to the next bridge, called the Elburger bridge, we turned left into the Elburg channel and immediately stopped on the right alongside some open space where I defied ‘no mooring’ signs and could give Max his proper morning walk. We then moved on down the channel as the rain returned but fortunately it was dry when we stopped at the pump-out and water point to service the boat. 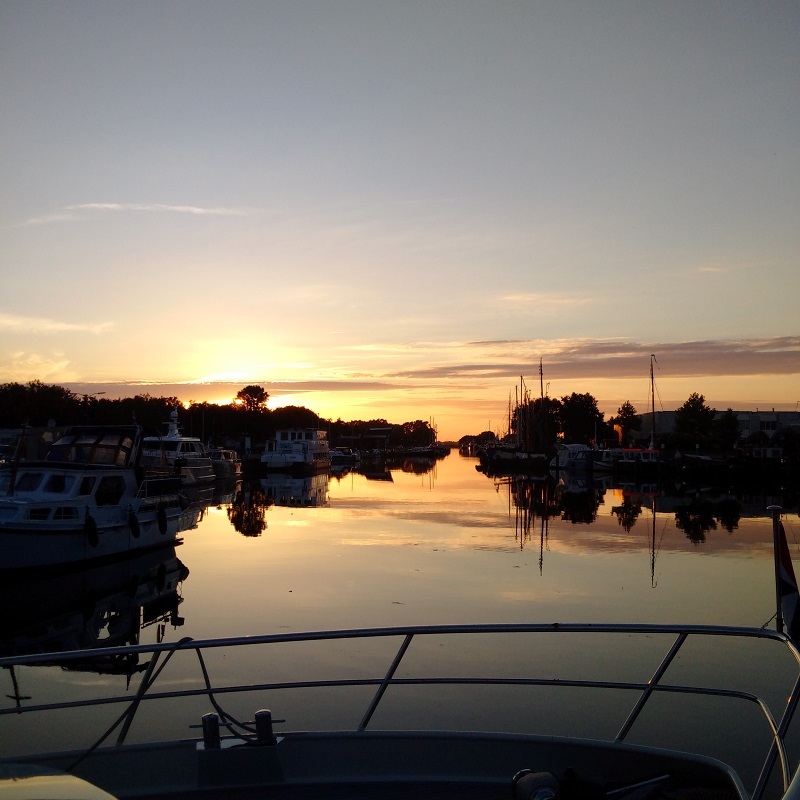 I helped a Dutch couple to moor and they were friendly and explained the harbour to us and assured us we could moor in the Binnenhaven after all. Once we had moored, we realised that the small boat in front was occupied by that nice family that has helped us off the dinghy with Max in the Yacht cub the day before and they helped us translate some signs as well. It transpired that the signs permitting mooring activity for daytime only referred to double mooring (or rafting) during that time and so we were in the clear.